Sources of information: There is an excellent website about the entire Kektura in English! I used in preparation of this trip and after completing it I must say that I find all the information on it correct and valid. 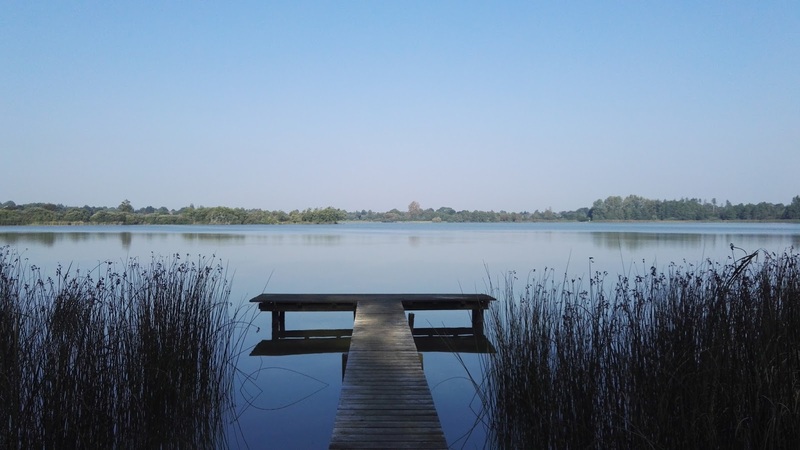 This website contains not only general information about hiking in Hungary, but even detailed trail descriptions in Englisch and even most of the maps! You will find all you need for a Kektura thruhike there. Maps, guidebooks and navigation: There is a Hungarian map/guidebook in two volumes for the Kektura. If you buy it here in Germany it will cost you more than 50 EUR! I bought it, carried it on the trail - and never used it. If you still decide you want it (although all the text is in Hungarian - you can only use the maps and get an overall impression from the pictures), then buy it directly in Hungary where one book will only cost you 10 EUR. There are two German guidebooks without maps for the Eastern half of the Kektura: Budapest - Putnok and Putnok to the Slovak border. I used them, too and although I found them quite useful in times they are already a bit outdated - and you don't really need them. Why? Because first of all the waymarking of the trail is fantastic - if you don't see a blue blaze for 5 minutes you know you are off track. Secondly, OSM based maps are really all you need for navigation. I had the OSM map of Hungary on my GPS and the openandroid map for Oruxmaps on my smartphone as a back up. The latter is especially useful as it also shows the water sources in the villages. Water sources: There are several springs along the trail but most of the time I got my water from the blue public water taps in town. They are leftovers from the times when houses were not connected to the public water system. 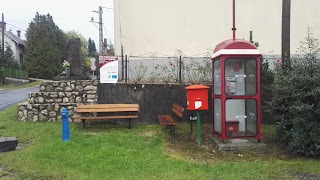 Nowadays most of them don't work any more but in most villages there are still some functioning ones left. And there are also the good old cemeteries that all have water taps as well. On my winter hike I carried a maximum of 2 litres. You come across a water source at least once or twice per day - usually even more! Shops: Most villages still have some sort of litte shop where you can buy basic supplies. Bigger towns have European chain discount stores like Aldi, Lidl, Tesco, Auchan. 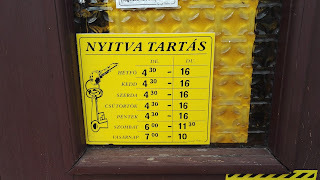 Stores open extremely early in Hungary: Village stores usually at 6 am, and even Aldi and Lidl open at 7 am. This means stores also close very early. Don't count on finding an open village store after 4 pm - and most already close at noon! Bigger shops are even open on Sundays! I hardly carried more than two days worth of food! Food: In every shop you will find bread which is dirt cheap. Then there is usually some sort of sausage or salami and some basic cheese - also relatively cheap for Western European standards. Surprisingly Milka chocolote is ubiquitous in Hungary -and costs the same as in Germany! There are also some good packaged cookies - but the nuts section is usually not very well stocked. 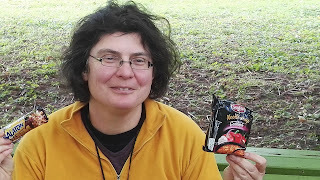 Dehydrated food is hard to find: Hungarian type "top ramen noodle soup" is available in most village stores but it tastes as bad as the American original and I only used it for emergencies. Town shops though stock a lot of "Knorr" packages mostly imported from Germany. The photo shows a Hungarian specialty: Turos rud - a curd filled chocolate snack that you will find in the refrigerated section of even small village stores. 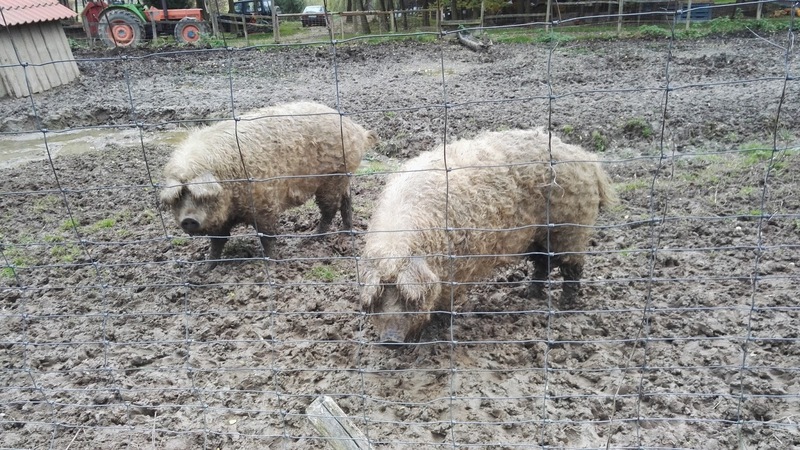 Restaurants: are very rare in the countryside, but if in town treat yourself to a nice meal. A glass of wine costs only around 0.80 € and a full meal 5-10 €. 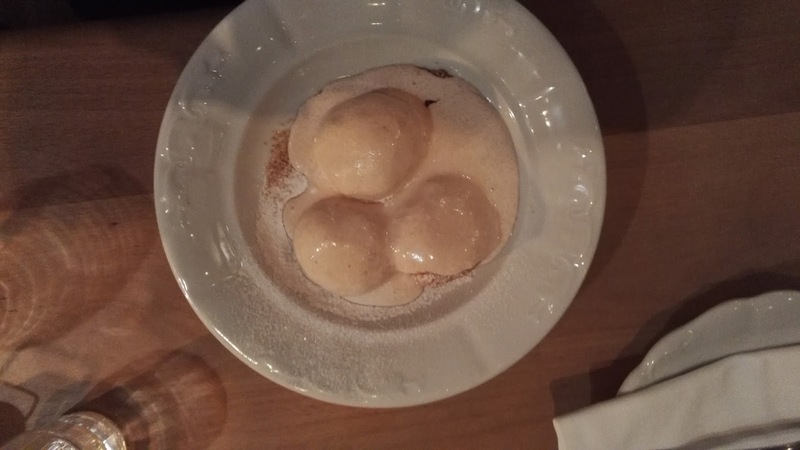 I especially loved the desserts! Wherever I ate out the food had really good quality. Keep in mind that "gulyas" in Hungarian means goulash soup only. Restaurants close very early here - especially in the countryside. 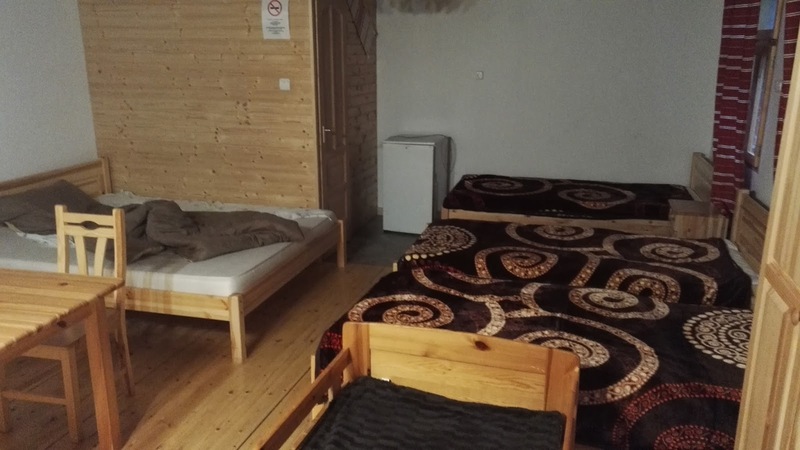 Accommodation: is cheap and plentyful in Hungary! Even in most small villages you will find a holiday apartment or private rooms. 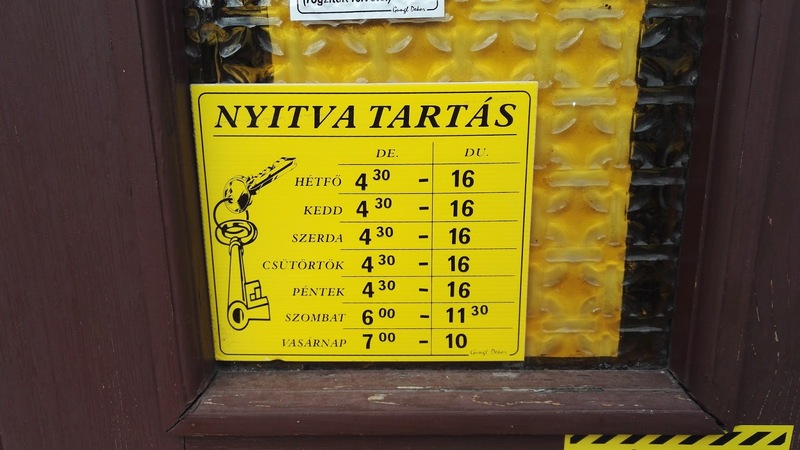 Unfortunately, most hosts speak Hungarian only which makes reservations by phone difficult for foreigners. 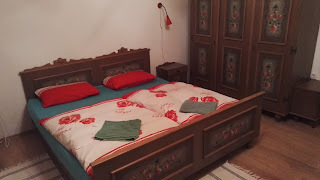 The main website for private accommodation in Hungary is szallas.hu, but is in Hungarian only. They cooperate with Revngo.com which looks like a fraud website because their horrible translations - but I have booked several rooms through them and it always worked. Booking.com is another option for Hungary. Most cheap accommodation is holiday apartments or even cottages. This is usually much cheaper than a hotel room! Don't be surprised to find out that you can choose between four beds in your room! Expect to pay between 15 - 25 € for single occupancy and up to 35 € for double occupancy. Every single room I have stayed in sparling clean but don't expect modern furniture. Always carry a smart phone in Hungary. Most landlords don't live at the rental place, so you will have to send an email or a text message with your arrival date. 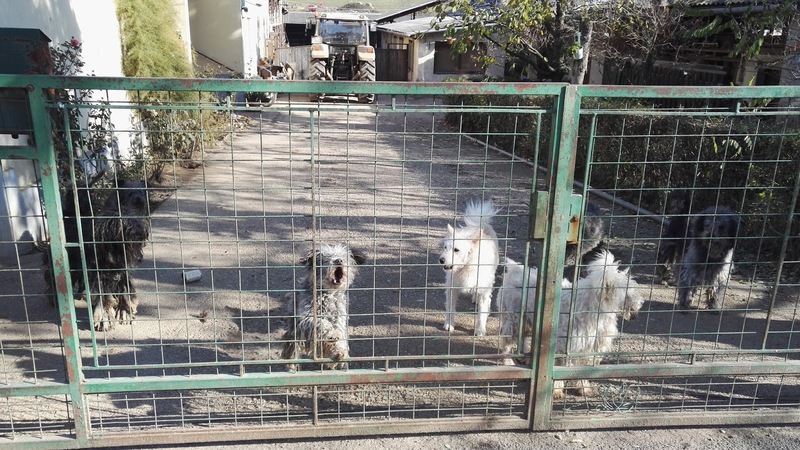 Dogs: When you walk through any village you will be greeted by a dog concert. Everybody in the countryside seems to have a dog. 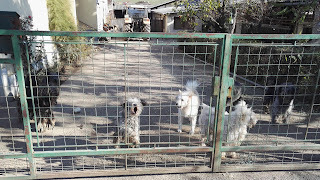 The good news though is that all these dogs are well fenced in - I encountered very few stray dogs. 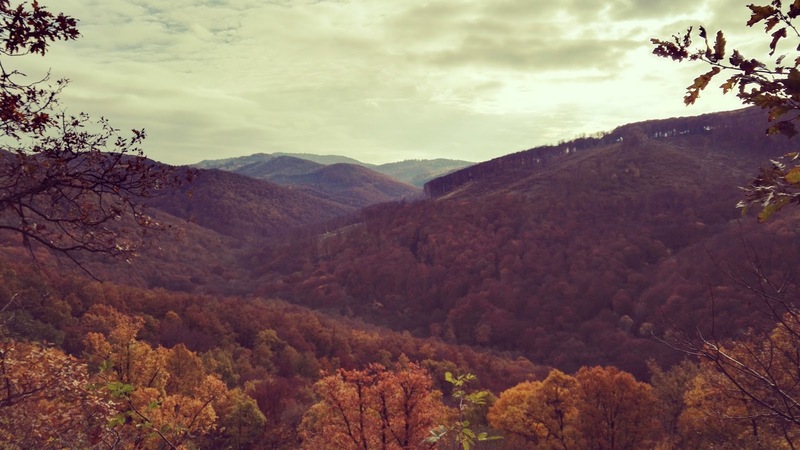 Although plentiful and loud, dogs are not a danger for hikers in Hungary. 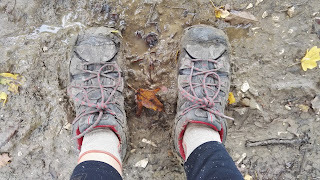 Dangers and annoyances: Although hiking through Hungary is a very pleasant and relaxing experience I found two things that were a problem for me. The first one my only be a perceived but no real problem: the gypsies or Roma people! In Eastern Hungary you walk through a lot of Roma villages. I was shocked by the poverty and felt like walking through a ghetto. I must say that I was scared at some places although nothing happened - and I have not heard of any single incident involving hikers. There is a very good article about the topic on the English Kektura website! 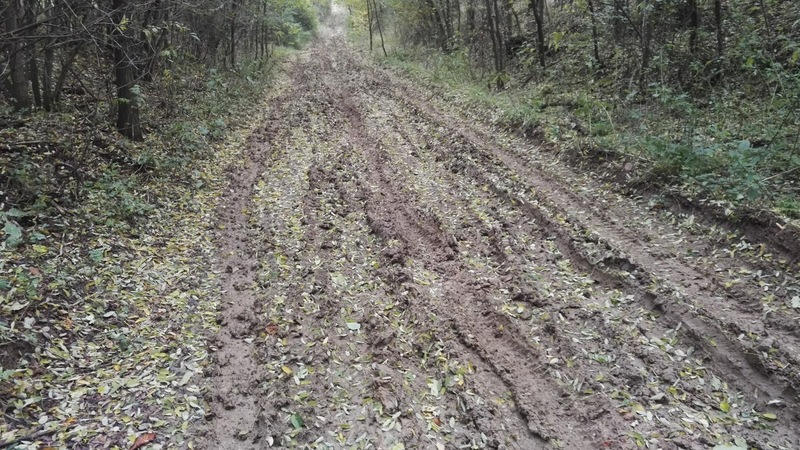 The second (and more real) problem was the mud: If it rains a lot most forest roads turn into mud slides - especially when they are harvesting trees. Stamps: Most Hungarian hikers collect stamps along the the Kektura. You can buy a specific booklet for that and you will find the stamping places all along the trail. I didn't do it but other hikers told me that it is great fun. 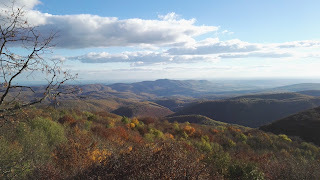 Seasons: I thruhiked Kektura in October and early November because I was told that this is the best season. I had bad luck because it rained a lot and got cold very early which is unusual. 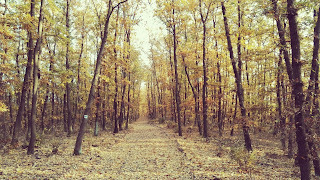 I would still recommend hiking here in either spring or fall. Winter can be very cold here and summer is too hot in Hungary. Transportation: Buses and trains get you anywhere in Hungary - and they are very cheap. I would recommend flying to Budapest and then take public transport to the place where you want to hike. Hungary is not that big and you should get to any major point along the trail in less than 5 hours. Hungary has a high margin of error: Let me explain what I mean with this. 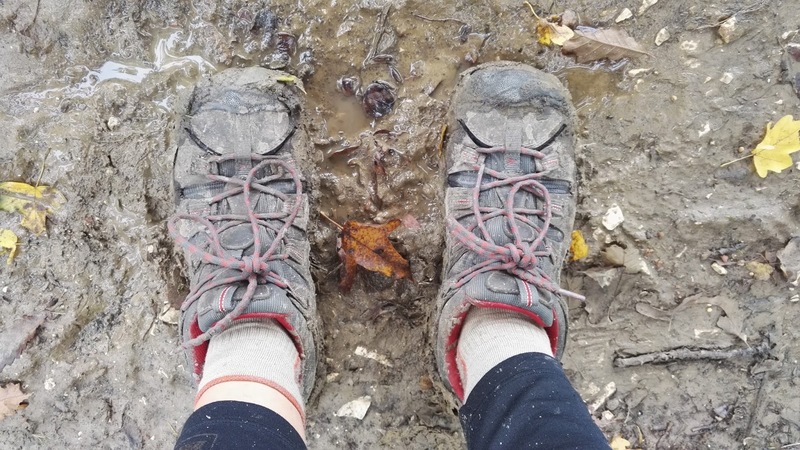 Beginners tend to commit more mistakes than experienced hikers. And if things go wrong you somehow have to get out of the situation. In Scandinavia this can be tricky: The weather is usually adverse, in the North there is not much shelter from forest and if you have to bail out it will cost you a fortune due to the high price level in Scandinavia. 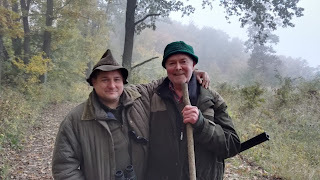 Hungary is so much more "forgiving": The weather is moderate, there is not much altitude or exosed areas and you are mostly walking in forest where you are sort of sheltered from the elements. Plus the waymarking is so good that is is diffcult to get lost. But if you have to bail out it will be cheap: Hungary has a great and very cheap public transportation system that serves literally every little settlement. The infrastructure is great with little shops in almost every village. Water is not an issue due to an abundance of public water fountains in every settlement. 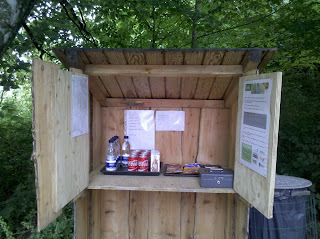 But most important: Accommadation is plentyful and cheap: I usually paid between 15 and 25 EUR for one person. So if the weather turns bad or you are simply too tired you can just treat yourself with sleeping in a bed under a roof! High fun factor: Due to the relatively low price level you can easily treat yourself once in a while - with sleeping in a cosy bed or eating in a restaurant. I loved the food which was always really good quality at cheap or moderate prices. As you can see I especially liked the desserts. And I should not forget to mention that a glass of wine will set you back less than 1 EUR!. Plus Hungary is full of thermal baths and it is so relaxing to soak in hot water after a long day of hiking. 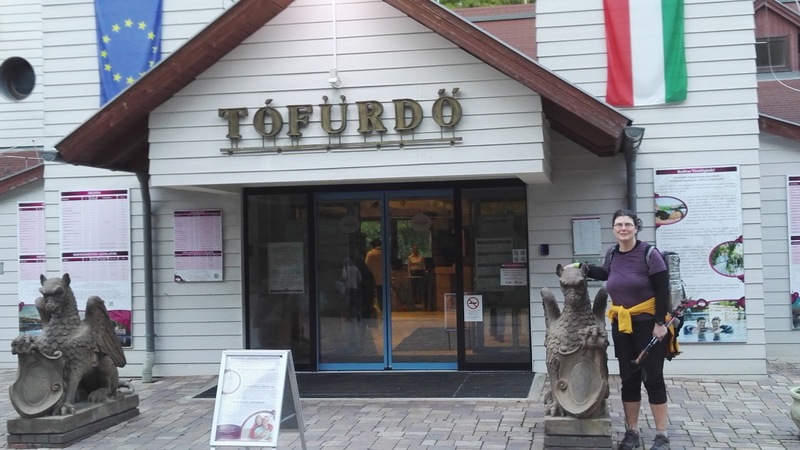 A visit to a thermal bath will set you back something between 5 to 10 EUR - just bring a swim suit. Honestly, I don't understand at all why Hungary is not more popular as a hiking destination. Ok, it lacks alpine scenery, but it offers an abundance of beautiful decidouos forest where you will probably not see a single soul in days but plenty of wildlife. In no other country I have seen so many deer, wild pigs and mufflons. Hungary is very sparsely populated and you will definitely see a lot less people on the Kektura than on the Kungsleden in Sweden. Plus it is so cheap and easy to get there. Both low cost airlines Ryanair and Easyjet fly from Germany to Budapest. So if you look for a interesting new hiking destination go to Hungary - you won't regret it! 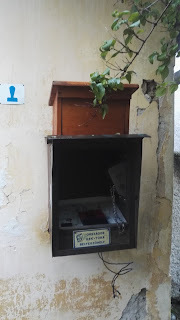 Eger in Hungary is not to be confused with Eger in the Czech Republic. 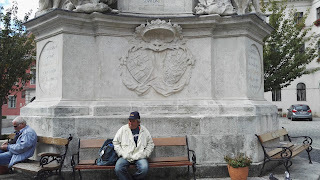 Eger is the Hungarian name of the town which in German used to be called Erlau. And the "winos" might know "Erlauer Stierblut" or "Bull's blood from Erlau", a usually rather mediocre wine. And as you might deduct from that: I was in wine country here which led to a another meal in a restaurant accompanied with two glasses of wine. 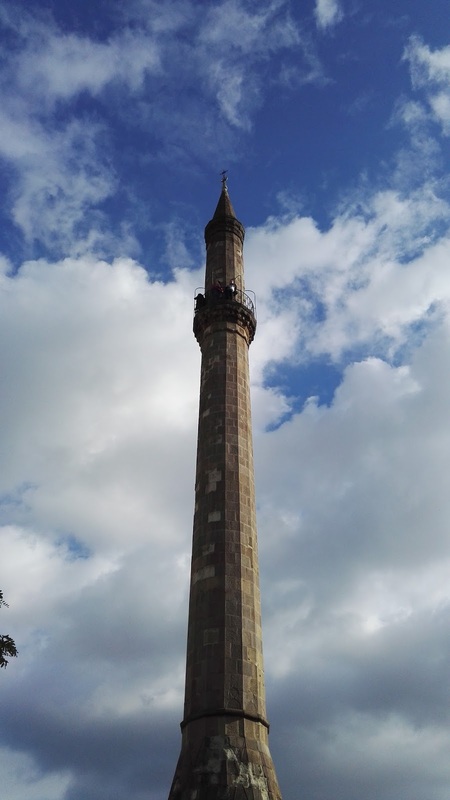 Eger' main attraction is this minaret still dating back to the Ottoman reign in Hungary. The Turks had occupied parts of Hungary for 150 years - from 1541 to 1699. So this minaret is the Northernmost minaret of the former Ottoman Empire! You can even walk up to the top. Eger also boasts Hungary's second largest cathedral. My favourite attraction though were the thermal baths again. It is just absolutely wonderful to soak in 36 degree hot water after a long hike! Going to the thermal baths is a very social activity here in Hungary: Most people come in groups of friends and hang out for hours in the hot pools. Some even sleep in the water or play chess on swimming chess boards. 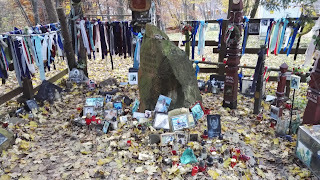 It was now getting close to November 1st - All Saints Day which is a national holiday in Hungary and apparantly a very serious business. Wherever I went cemeteries were lit be hundreds of candles and decorated with white and yellow Dahlia. And most Hungarians took advantage of the holiday to travel on a long weekend. Usually I did not see anyone in the forests but now again loads of people were on a hike - but no one was camping! I was now hiking in the Bükk mountains -another small and beautful mountain range in Northern Hungary offering great views. Who can say now that Hungary is flat? After Aggtelek you hike through Gypsy country. There are Roma people all over Hungary but many are concentrated in this region. The poverty they live in is shocking. 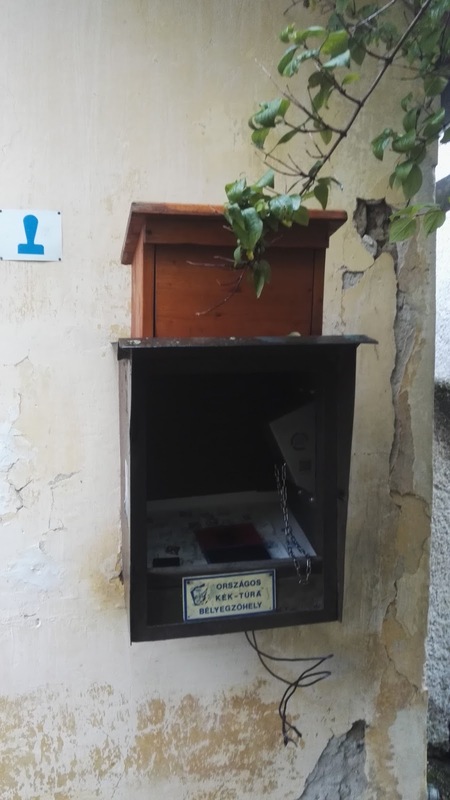 You realized at once when you were in the "Roma" section of a village: Garbage everywhere, stray dogs and run down houses that would be classified as ruins in Germany with laundry hung up for drying. And lots and lots of little children on the roads. 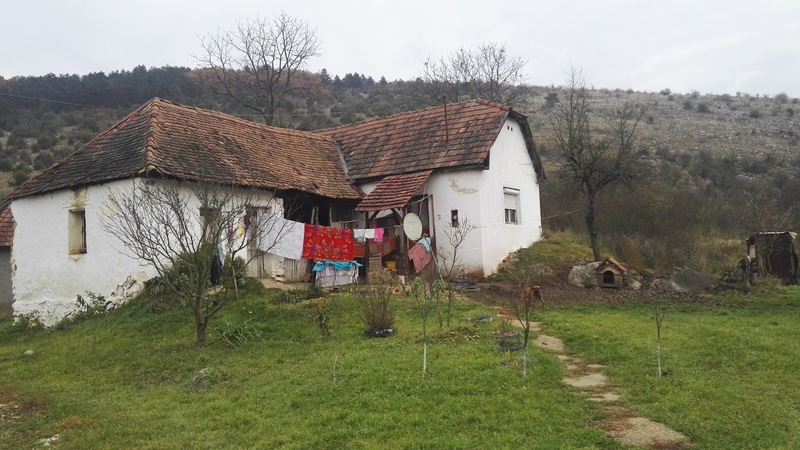 Most villages here are "mixed", but in some villages only Roma people were left. 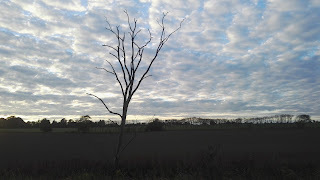 After Aggtelek National Park the landscape got flatter again and more agricultural but still offered some great views. Although the weather was still very sunny during the day temperatures dropped well below freezing every night. Combined with very little daylight and long hours in the tent this made camping very uncomfortable. Therefore I spent the last week on the trail mostly in accommodation and really enjoyed it. 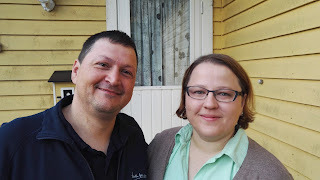 Each place was nice and special and my Hungarian hosts offered great hospitality. 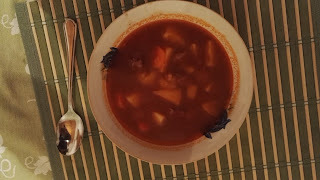 One time I was greated with a little bottle of Schnaps, another time I was offered a bowl of Gulasch soup. Many places were heated with wood stoves - and it is just great to relax next to such a stove after a long day of hiking. My hike ended just in time - the day after I finished brought a torrential rain..... I decided to finish in Sarospatak instead of Satoraljaujhely. 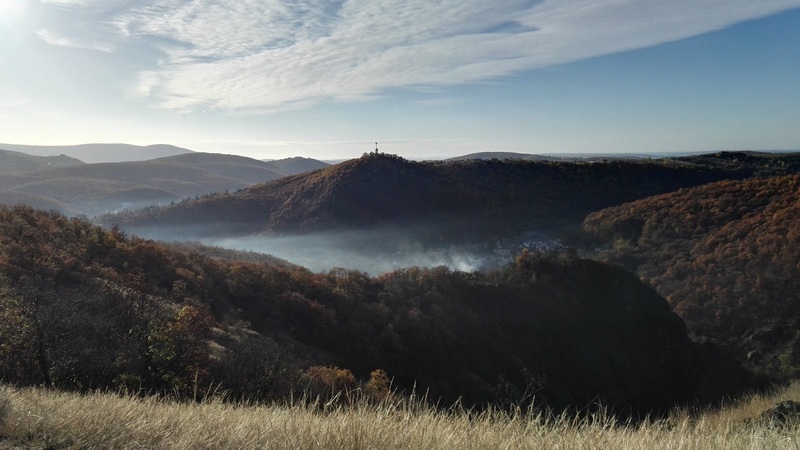 The two towns are just something like 10 km apart, but Sarospatak offered a thermal bath and Satoraljaujhely didn't. 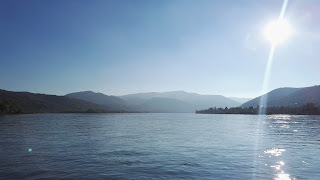 And then when I had arrived in Sarospatak after a last day of 30 km hiking I was too tired to go to the baths.... I guess it had really been time to finish my hike! These two gentlemen were a surprise encounter one foggy morning. One turned out to be a German hunter who comes to Hungary for many years to hunt deer, wild pigs and mufflons. I was not surprised: Every day I had seen wild life: dozens of deer including a very rare white Albino deer and several mufflons which look strangely out of place here..... Next to him is the Hungarian forester who confirmed what my guide book and Balazs had already told me: Wild camping is legal in Hungary - a fact that made my hiking life in Hungary really easy! I was now traversing the Matra mountains a very scenic little mountain range where Hungary's highest mountain is located: Kekes with 1014 m. I ascended on a long ski slope and was a bit disappointed with the rather unassuming summit. But there was a very touching little monument on top: This memorial for deceased motor cyclist who had died in motor bike accidents. Photos of smiling young men where everywhere - and several motorcycle helmets. Even when I was taking this picture of this sad place a couple on a motor bike approached to pay its last respects to the deceased. I continued on and made the mistake to not set up camp in time. I ended up contouring around very steep mountain slopes in complete darkness - no flat spot for my tent whatsoever. Eventually I came to a view point where there was just enough flat space for my little tent. Very much relieved I set up camp and was rewarded with a gorgeous view and sunrise in the morning! I continued in beautiful fall weather to my next rest day in Eger. My zero day in Budapest was a real highlight of this trip and this is mainly due to this guy: Balazs. 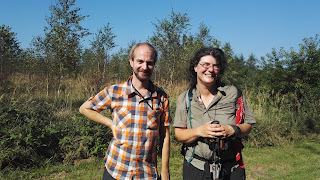 He is the only Hungarian who has thruhiked the AT so far and he had found me through my blog. 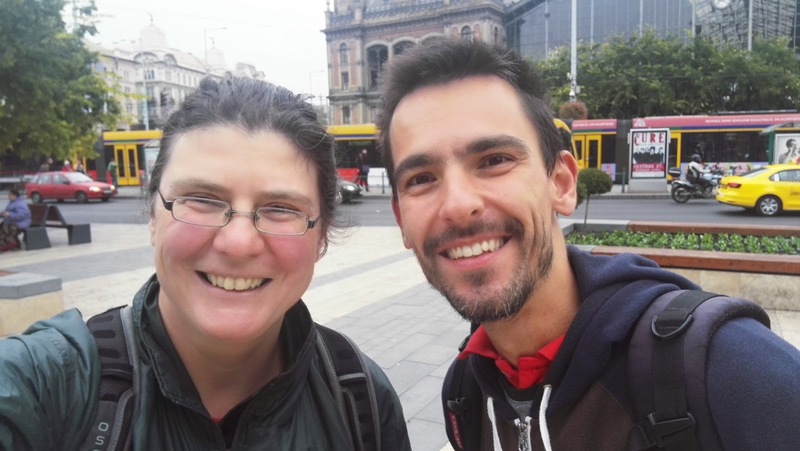 When I had posted here that I was planning to hike through Eastern Europe he had offered me his help and invited me to stay with him and his wife in Budapest. 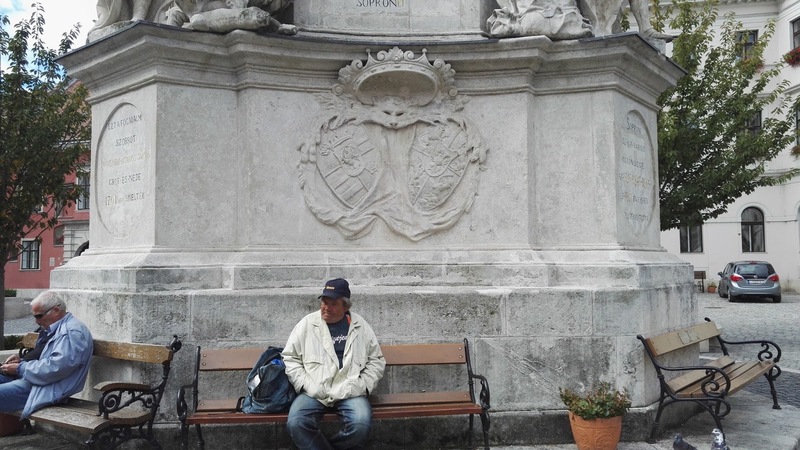 I very happily accepted his offer and met in Budapest Nyugati train station. We immediately connected well - no surprise with two thruhikers! Eventually I had found someone whom I could ask all the questions I had about Hungary - and Balazs answered them all very patiently. And he took me to two really cool places: First we went to Rudas spa, thermal baths right in downtown Budapest. From the hot tub on the roof of the building you can look down onto the Danube and the bustling city while soaking in 36 C water! In the evening Balazs treated me to dinner in a very hip place called Getto Gulyas. "Getto" because it is located in the old Jewish ghetto and "Gulyas" because it serves traditional Hungarian food. The serve a stew made out of roosters' testicles and combs! I did not dare to order that (which I now regret) but had at least bone marrow on toast as a starter. I left Budapest on a Friday and decided to shortcut the Kektura a bit which makes a big loop down to the outskirts of Budapest. The area north of Budapest is downright hilly, very pretty - and was swarming with people on a sunny weekend. In two days I saw more people than on the entire Kektura before and after! 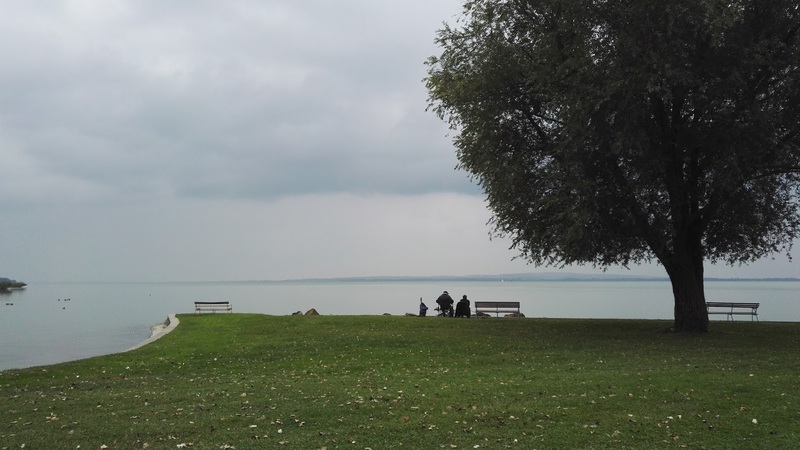 Although only October Lake Balaton was practically deserted. There were endless rows of holiday apartments and and they were seemingly empty. Waiting out the rain in front of a Lidl I met a fellow German who owns a summer house here and he gave me some interesting insights. Before the wall came down in 1989 tourism was booming here in Hungary because this was one of the few places where East and West Germans could meet. But ever since tourism is declining and hotels are empty - even in high season. We chatted a bit and then I left - trusting the weather report that had forecasted only a bit of rain. Unfortunately it was totally wrong. Rain poured down for hours and I was soaking wet when it got dark. Luckily there was one of the very rare shelters at the end of this day and I set up my tent underneath it. 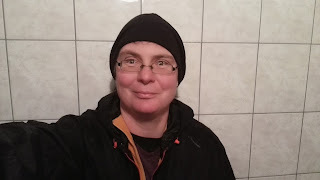 Next morning I had to realise that my clothes were inappropriate for that kind of weather - I had to buy some more stuff or I would suffer from the cold. In the next market town I entered a trendy fashion boutique and the poor sales girl must have thought she had an epiphany: I came in dripping with water, wearing a blue trashbag as a skirt and gesticualting around my head. But she quickly understood - and after five minutes I left the shop with this warm wool hat! Zirc was my destination for a rest day: the town boasts a huge monastery. Although the monastery and especially its library was impressive I was more fascinated by its recent history. During the Communist regime the monks were deported to prison and the abbott even tortured. He spent the rest of his life in prison and never saw his monastery again. The buildings were uninhabitable when the monks returned in 1990 to restore the monastery. My personal highlight though was the holiday apartment I had rented for my short stay: it had three bedrooms, one kitchen, one dining room, one living room and a huge bathroom with this bath tub. 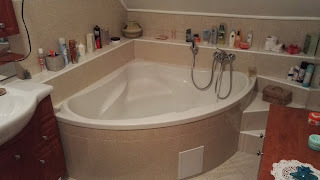 Of course I did not need such a big place but nothing smaller was available - and the whole palace just cost me 25 EUR! 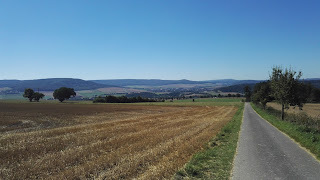 I now got closer and closer to Budapest - and the flat landscape became hillier and hillier. This picture is taken from Nagy-Gete at an altitude of 457 m.... the last 100 m were really much steeper than you would expect from such a flat country! From here I descended to the industrial town of Dorog and took the train to Budapest. I started my hike on October 3rd, directly after a presentation I had given in Germany. Thanks to Deutsche Bahn I arrived much later than expected in Sopron where I had planned to spend my first night in Hungary. As I had breakfast in a little park in town I was approached by a talkative old man who praised Germany in German: "Germany is the best country in the world. Angela Merkel is a great women." and so on. Apparantly he had once lived in Germany. And soon it became apparent why he was so talkative: He wanted some money. I tried to offer him some grapes I was just eating, but no luck. "The town is full of grapes but I need money to buy beer...." I gave him two Eur and he happily left. By the way: This was the only time in Hungary I was begged for money. I was excited to do my first resupply in Hungary at a Lidl and immediately discovered some interesting Hungarian specialties: The Hungarian type of Top Ramen Noodle soup with Gulasch flavour and a candy bar called Balaton Bumm! The noodle soup was ok but Balaton Bumm became one of my favourites - what a name! 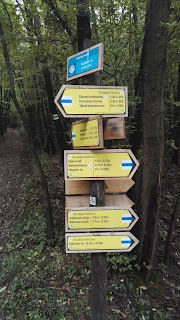 Then the hiking started at Köszeg at the Austrian border with some more positive surprises: The trail was incredibly well marked and there was forest everywhere. Free camping was dead easy! 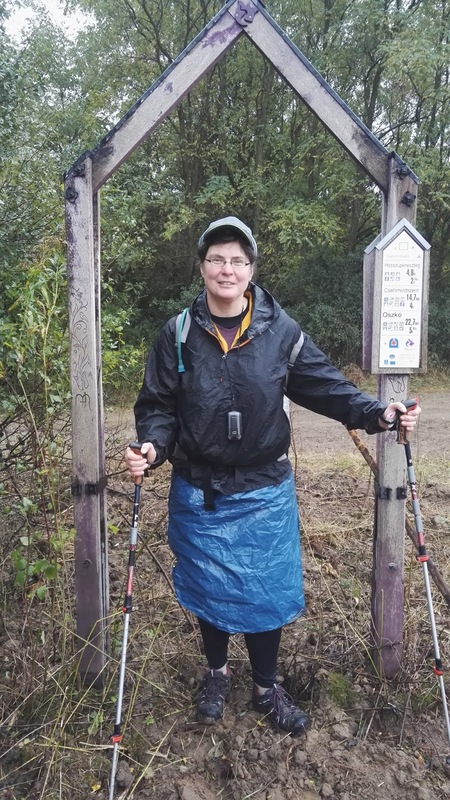 Unfortunately, the weather did not quite cooperate in this first week - it rained a lot and out came my favourite blue garbage bag as a rain skirt. 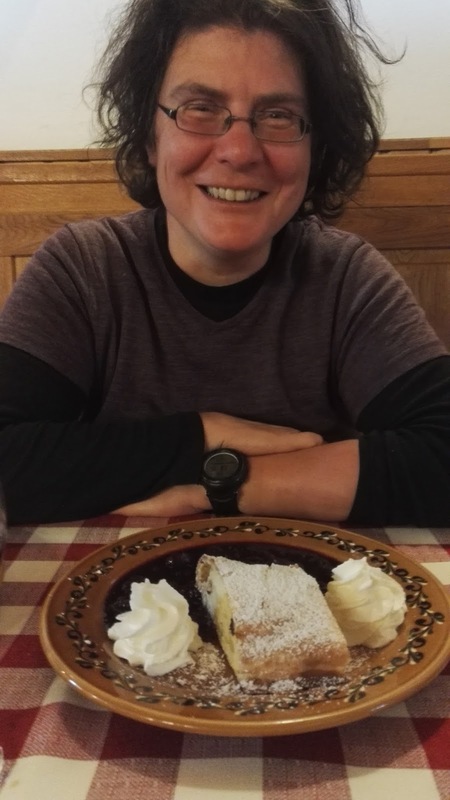 This photo shows me under the "portal" of Maria Ut or Maria Trail, a pilgrimage trail that traverses the whole of Hungary on its way from Romania to Mariazell in Austria, a major pilgrimage town. Maria Ut more or less parallels the Kektura for long stretches and I used it various times for short cuts or detours to resupply. 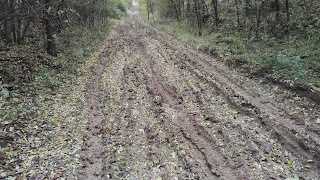 Other than most pilgrimage trails I know it is real hiking trail that stays in the woods most of the time. The landscape in this section is rather uneventful: Lots of forest and mostly flat - a rather pleasant than exciting hike. But a real highlight was soon to come: Heviz, a spa town which boasts the world's largest natural and active thermal lake. Even in the coldest winter the water temperature here never drops below 24 degrees C and on this balmy day in October I was swimming in 32 degree C water! The lake and the entire spa complex is plain huge. It attracts a mainly older clientele and despite having been renovated it still exudes some sort of Soviet-style elegance. The water has a strong sulphuric smell and it takes a while to get used to the slimey algae that cover everthing but it still was a very pleasant experience. My hiking season has not ended yet - I'll be on another trip in October. And it will be a rather exotic destination: Hungary which is usually not really on the European hiking agenda. 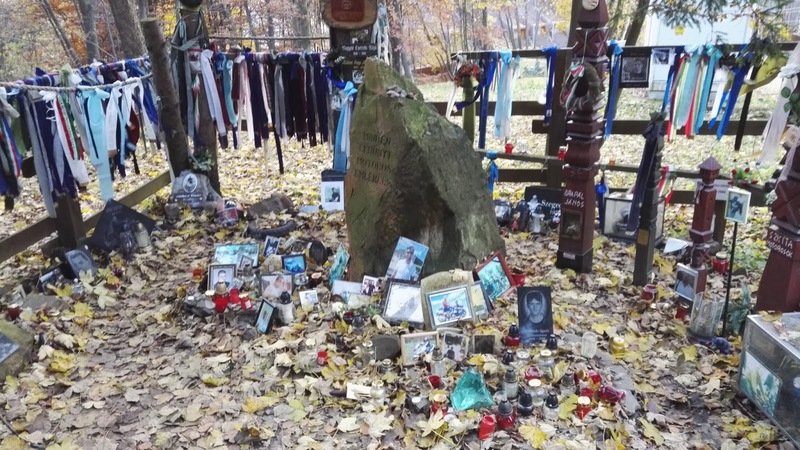 But Hungary boasts of one the oldest European long-distance hiking trails, the Blue Trail or Kektura as it is called in Hungary. In roughly 1000 km it traverses the entire country from East to West. Although very few Western European hikers know about it this trail is extremely popular in Hungary itself. 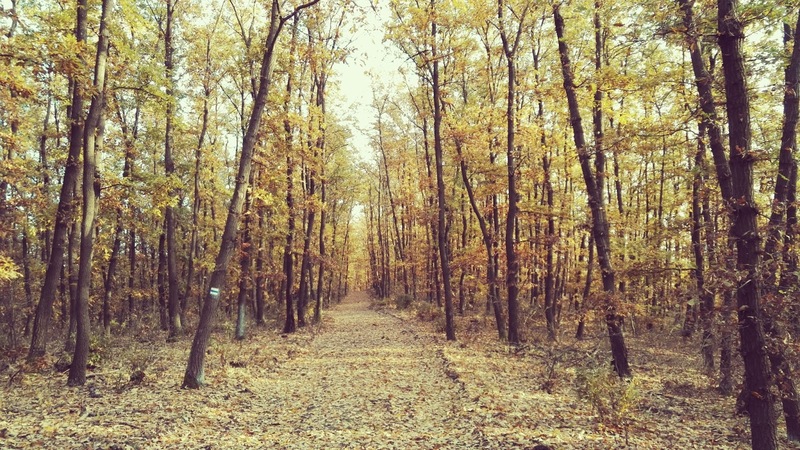 And fall is one of the best seasons to hike there! I am extremely curious what is waiting for me there! I have hiked this 380 kilometre long stretch in summer 2015 together with a friend for whom it was his first long hiking trip. 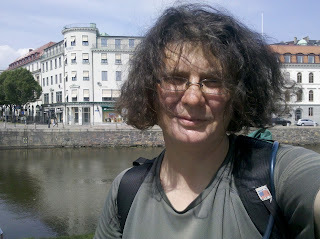 After an overnight bus trip from Berlin we started at a windy morning in Gothenburg centre. I had been here the year before at the end of my paddling trip and could therefore lead us directly into the only cheap and vegetarian restaurant in the city centre for a last decent buffet meal before setting off. The first day was on the very comfortable Bohusleden passing fantastic swimming lakes - and hordes of vacationing Swedes. 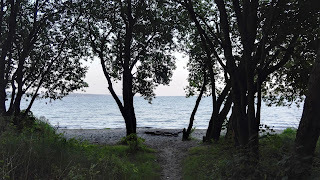 We took the evening ferry from Varberg to Grena in Denmark which meant that we arrived after dark - and finding a stealth campsite turned out to be difficult. There was a small forest within walking distance from the ferry landing - and it was crisscrossed by endless trails. 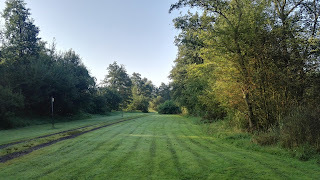 Eventually I thought I had found a hidden campsite - only to realise in the morning that I was camping right next to a jogger path. We left pretty quickly and were greeted friendly by some curious joggers when we packed up. 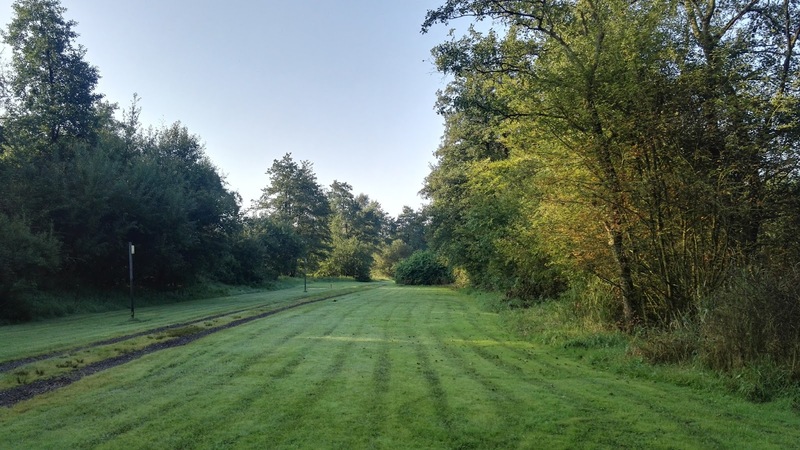 The E1 now follows some unknown trails: First Molsruten and then the Silkeborg-Arhus-Trail. Both trails were rather unspectacular and even the sea did not invite me to go swimming. To sum it up: This stretch has not been the most exciting hiking! 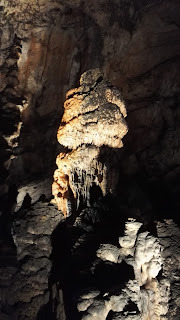 It has been a pleasant experience and it was a great hike for beginners but I would not particulary recommend it to anyone. But on every long-distance hike there are connecting bits - and this was one of them. Now let me answer the usual two questions at the end of each trip: Did I like this trip? Yes, I did! For me, after major surgery and a 6 week reconvalescence this trip has been ideal. The terrain was easy. No steep ascents or descents. I came across a supermarket almost every day which meant a very low pack weight. Navigation was relatively straight forward. Only where the E1 is not part of a another major trail the trail marking was less than perfect. Also I had enjoyed the most perfect summer weather! But would I recommend it to a friend? Probably not! Why not? The biggest drawback is the high percentage of walking on pavement. The part from Koblenz to Hamburg was still tolerable, but after that the route was more than 50% on concrete. The North of Germany is much more suitable for biking than for hiking. Also the scenery is nothing to write home about. It is flat. All you see most of the time is fields. In bad weather this must be miserable! Although parts of the trail like the Rothaarsteig and the Heidschnuckenweg were really nice, on average this trail was rather an average trail. 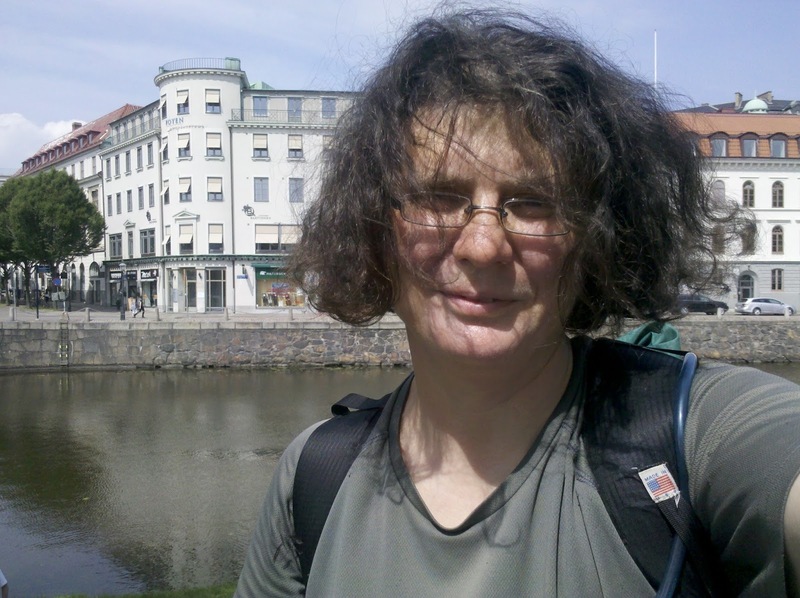 There is much better long-distance hiking in Germany. 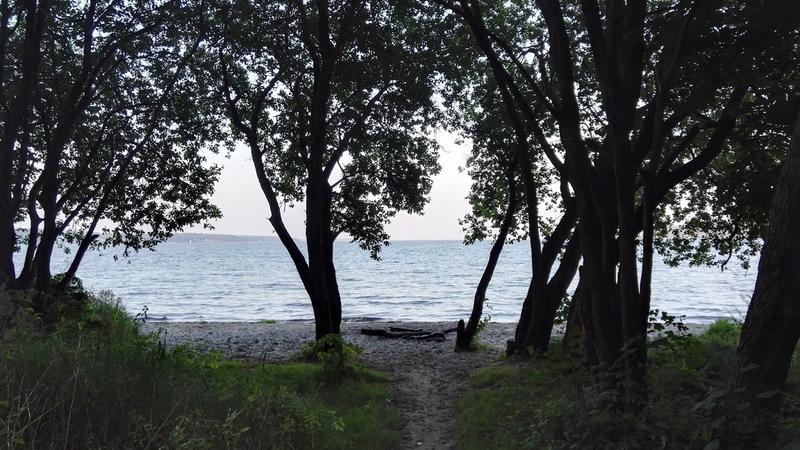 In Flensburg I crossed over into Denmark - on a tiny little path through the woods. To my utter surprise this border crossing point was staffed: Two Danish policemen were controlling it - despite the Schengen contract. I guess this is the result of the European refugee crisis. I asked the police guy if he wanted to see my passport. "Yes, please! ", he answered. "Although you don't look like you'd be carrying an illegal Afghan refugee in your backpack!" 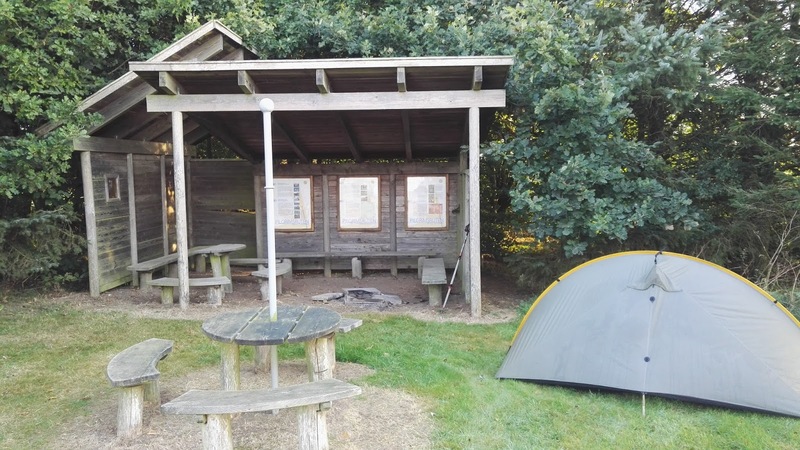 Once on the Danish side I detoured a bit from the E1 that is called Haervejen here because I wanted to stay at one of the designated free Danish campsites. 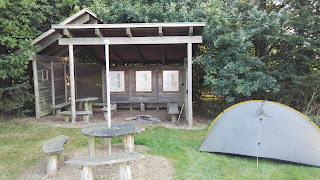 And what a great campsite it was: Right from my tent door I had a great view over the Flensburg Fjord. I left my tent door open at night and watched the moon rising over the Fjord and listened to the soft waves of the Baltic Sea - it was a great night! Next day brought a nice surprise: At midday I saw three hikers sitting directly on the trail. Since I had not seen any hikers for many days I stopped to chat. And then it turned out that I had stumbled across Sven Lewerentz who runs a website about the E1! Sven was accompanied by his girlfriend and his mother. His 76 year old mother had started to section hike the E1 already 30 years ago and she has passed on her passion for the trail onto her son. 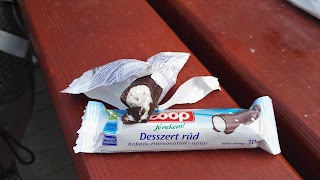 I even received trail magic on Saturday: In the village of Jegerup I decided to have my lunch break. I headed over to a nice picnic pavillion in the village centre when an older lady stopped me to tell me something in Danish. 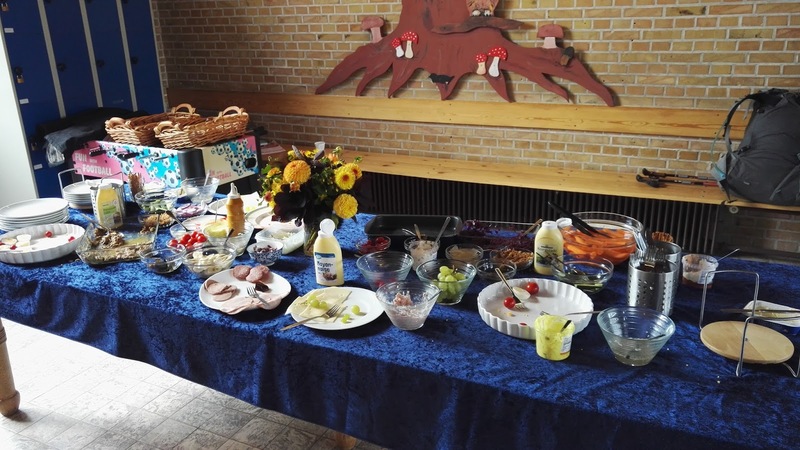 I don't understand much Danish but "gratis frokost" seemed to mean "free food" and so I immediately followed her invitiation into the parish hall. There I was told the whole story: Today was the yearly village festival where everyone in the village contributed something to a big brunch. And of course I was invited! Unfortunately I was a bit late but there was still enough left for a hungry hiker. So today was smoerebroed instead of packaged noodle soup! On September 4th I was back in Hamburg and crossed the river Elbe on a ferry from Cranz to Blankenese. In Hamburg the E1 splits: the main route heads East and continues up to Schleswig along the Baltic Sea Coast. But there is also a shorter Western variant which I took due to time restraints which is called Schlei-Eider-Elbe-Weg. Therefore I now walked East around Hamburg. I was really worried about this stretch because I was still very close to a big city and could not get all the way around it in one day of hiking. I had carefully studied the map and had found a little forest that looked suitable for free camping but it was still awfully close to civilisation. Two hours before sunset I was still in the outskirts of Hamburg where I found a little Asian take away restaurant. I decided to have dinner there before I headed out again to find a stealth campsite. All turned out very well in the end. Although there were still plenty of dog walkers and joggers out there I found a great hidden place in my little forest and slept very well. Two nights later I slept under a roof again. 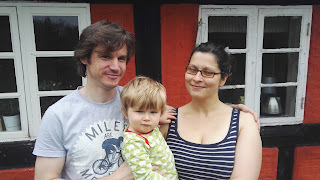 Ute and Josef, two "fans" of my book had invited me to their place close to Itzehoe. They are planning to hike the AT next year and had plenty of questions for me. We spent a pleasant evening with lots of trail and gear talk - and great food. They made a fantastic barbecue for me and Josef prepared the world's best fried potatoes for me! They became trail angels before they turn into thruhikers and gave me some very nice trail magic! Next event was the Nord-Ostsee-Kanal, a very busy canal that connects the North Sea with the Baltic Sea. 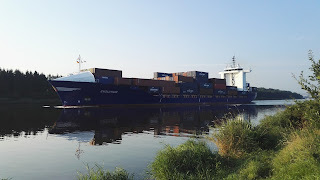 I hiked 13 km along the canal with huge container ships at my side which saved me more than 50 km on the E1. But time saving was not my main reason for this shortcut. I really love canal paths. They provide easy and quick hiking - and love ship viewing. The sun was burning down relentlessly this morning but I chose the shady side of the canal and therefore spent a cool morning. In the little town of Tellingstedt I struck gold again. I had just wanted to fill up with water again here but then I discovered a campsite on my map. I hardly ever stay at campsites but I thought that maybe I could pay for a shower there and then hike on. When I got there a sign announced that the campground was still open but not a single camper was to be seen. Only in one corner of the huge place two locals were enjoying a barbecue. They told me that the place was indeed officially open but hardly any campers ever came here because the town council was hardly promoting the place. The last permament campers had left the site some days ago. I asked them where to pay the camping fees and they just laughed. So I stayed at this perfect place with nice hot showers and an immaculate lawn for free. There was even an Aldi close by where I bought an opulent dinner before I bedded down in this huge place. Shopping at Aldi's these days was bit bizarre. 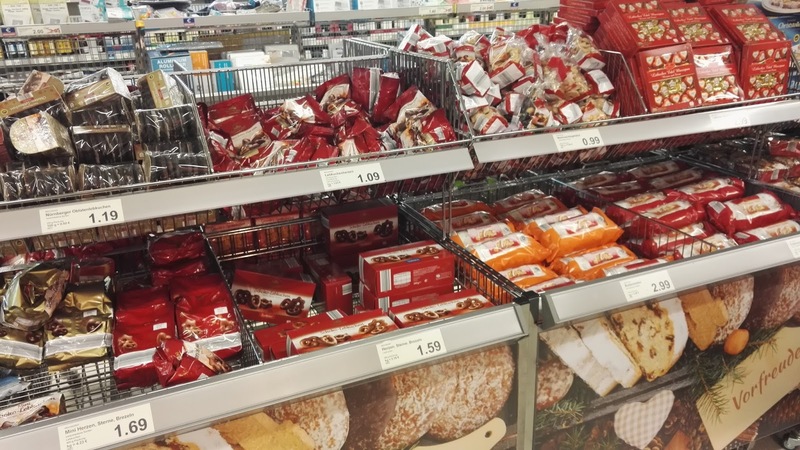 Outside temperatures still reached more than 30 degrees everyday but at Ald's they were already stocking Christmas sweets. I also discovered that Aldi and Lidl stores are air-conditioned - a great relief from the heat. Hiking became more and more tedious because the landscape was completely flat now, hardly any forest and the trail consisted mainly of bike paths. 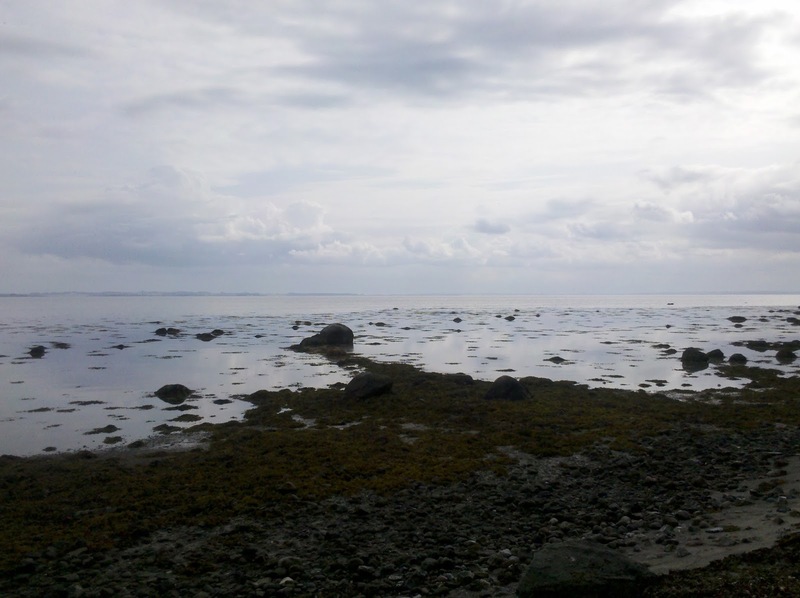 Schleswig-Holstein is definitely more suitable for biking than for hiking. 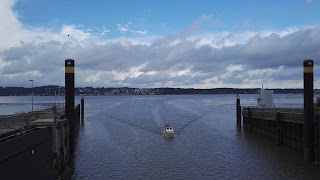 From the town of Schleswig I took the train to visit a friend in Rendsburg and have a rest day. In Schleswig the two E1 variants come together again and now follow the Ochsenweg which is also a pilgrimage trail. It is called Ochsenweg or Cattle Trail in German because this is the route on which cattle was driven from all over Denmark to the big cattle market in Hamburg. 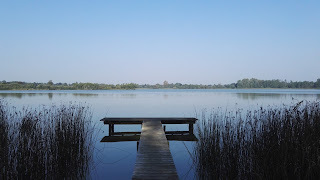 I liked it best for its two lakes that made great swimming! The weather was still unbelievable good - I have had only best summer weather for four weeks now. Summer weather does not get any better than that in Germany! 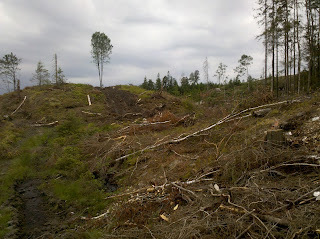 Still I must say that the part through Schleswig-Holstein was my least favourite of this hike. 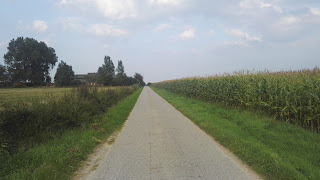 More than 50% of the route were on pavement, mostly on bike path. All I saw was endless fields that smelled horribly of liquid manure. And stealth camping was a huge problem because there is hardly any forest. There are much better places in Germany for hiking!